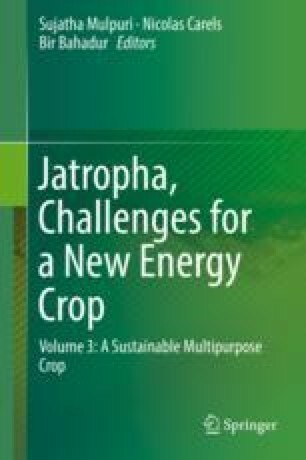 Jatropha curcas, a non-edible oilseed species with several uses and extensive lucrative prospective, is considered as a potential biofuel plant. Even though the genus Jatropha comprises ca. 200 species, to date just a few species have been investigated for their chemical constituents. There are still many species that have not received much attention on phytochemical and biological actions. On the other hand, few Jatropha species have been recognized for the pharmacological action of different crude extracts, proteins, peptides, and isolated compounds as antimicrobial, antifungal, antioxidant, anti-inflammatory, antidiarrheal, antihypertensive, antidiabetic, anticoagulant, and anticancer agents.